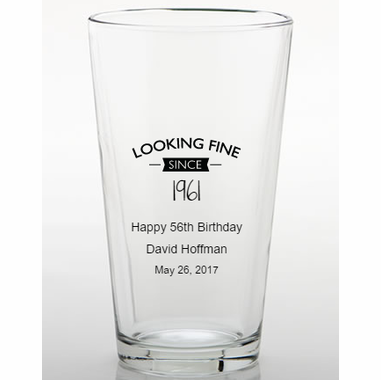 A sturdy and functional favor, these custom beer glasses can be used as birthday drink ware as well as a take home gift. Whether the guest of honor is turning 21 or 50, guests will enjoy having the glass as a memory of the party. Made in the USA, each is 16 ounce glass measures 6 inches tall and 3.5 inches in diameter. 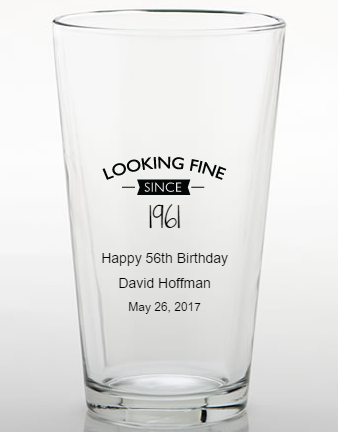 The design has a classic tapered pint glass shape. The glasses are shipped in bulk packaging. Ordered these for my husbands 60th Birthday, I filled them with his favorite candy and then wrapped in a clear gift bag and gave to guests as parting gifts...they loved them! Ordering and customizing was easy, delivered on time and great quality for the price. So happy with my order!